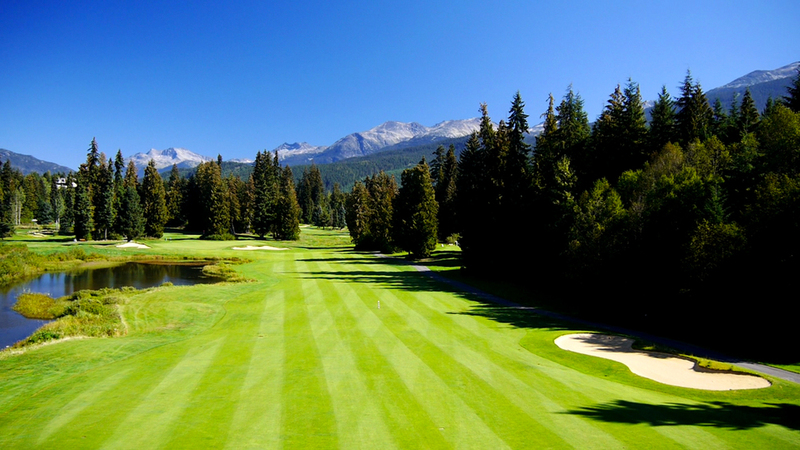 Score Golf Course Blog - Whistler Golf Club, Whistler, B.C. The golf season in Canada is winding down. Superintendents and greens crews are preparing courses for the annual freeze, and soon we will all look south towards warmer locales. Here in the lower mainland of B.C., we’ve entered the annual rainy season, and while many courses are still open and will remain so through the winter, golf takes on a whole different form. This time of year is for the enthusiast, the player who can’t go weeks, let alone months without a golfing fix. At this time, I find myself reflecting on the season that was and in particular the rounds and courses I especially enjoyed. One such day was at the Whistler GC in late June. The weather was perfect, the conditions excellent and the golf firm, fast and loads of fun. Located in the Village of Whistler, the par-71, 6,722-yard Whistler GC winds itself through the spectacular Whistler Valley. Snow capped peaks can be seen all around; majestic firs and ancient cedars abound. The setting truly is unforgettable and really speaks to the attraction of Whistler as a world-class resort destination. While all three Whistler courses (Nicklaus North, Chateau Whistler and Whistler GC) pack a great resort destination punch, in my mind, Whistler GC holds a special bit of golfing charm. The Arnold Palmer Design layout opened in 1983, and was the King’s first effort in Canada. The eminently walkable layout — a rarity for mountain golf — features generous fairways and putting surfaces, yet provides just enough bite to challenge. In 2000, the course underwent an extensive $2.2-million renovation to ensure continued excellence in conditioning and service for which it’s known. In my mind, the charm of the layout comes from a pleasant blend of holes with just enough variety and challenge to keep your brain working. Many holes are generous from tee to green and the warm mountain air helps the ball fly just that little bit farther than you expect. When we played in June, the greens were firm enough to test our approach shots, yet pure enough that every putt had a chance to go in. Birdie opportunities were available yet the undulating green surrounds, well-placed bunkering and firm conditions kept scoring at a premium. The fourth hole is a classic drivable par 4. At 301 yards from the back tee, this straight away hole tempts you to swing for the green. Your task is obvious and quite attainable yet the fairway is partially hidden by a shallow rise in front of the tee providing just enough doubt. Trees and a bubbling stream guard the entire right side and four bunkers protect the generous green. Any score is possible on this devilishly simple par 4, which is why it’s treat to play. Another great hole and the signature hole at Whistler GC is the long par-4 16th (pictured at right). At 460 yards from the back, it is one of the most challenging on the course. 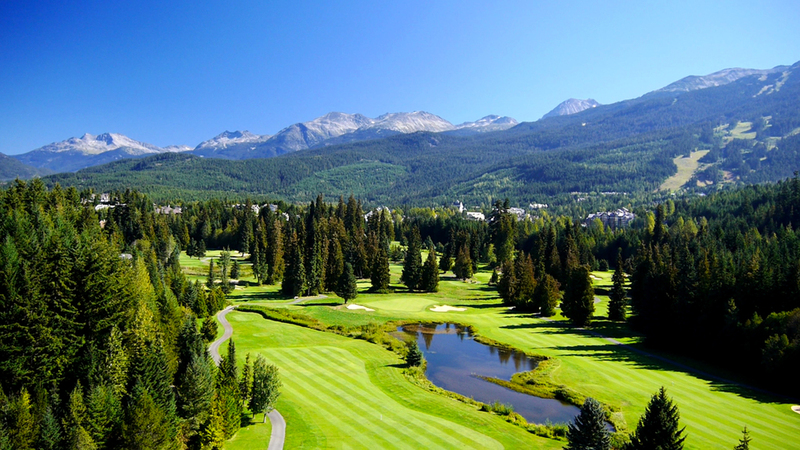 You tee off from an elevated position, immediately adjacent to one of Whistler’s busy trails. You must carry a small lake and stream, hitting towards a fairway angled slightly to your left. The stream continues along the left side, turning into a large pond, then stretches towards the green. One lonely bunker sits to the right of the fairway and provides a great aiming spot. The carry appears much farther than it is, and the hole often plays downwind, so we were pleasantly surprised by the length of our tee shots. This approach is one of the best shots on the course. Playing anywhere from 140-240 yards, you must hit across the corner of the lake to an angled green with bunkers short and long. Wow, it’s a great hole and par is a very well deserved score. Before you can enjoy a beverage on the great patio, you must tackle the strong 425-yard par-4 18th hole. Also playing downwind, this straight away tee shot is pinched at driver distance by a bunker and some undulations in the fairway. If you keep your drive in the fairway, you are rewarded with a short iron to a large green framed by the clubhouse. If you miss the fairway, an awkward lie in the rough and a green with just enough slope to challenge stands between you and your well-deserved reward. Whistler GC may not offer the same difficulty as its neighbouring courses, but it provides a thoroughly enjoyable golf experience, with great conditioning, in a setting that is truly magical.